It's another Mod of the Moment! If you've seen this house you don't quickly forget it. Reactions are polar- you either love it or hate it. Never in between. And thanks to Modern Tulsa you can drop in and form your own opinion this Sunday! The home, known as the Scherbatskoy house, began life as a typical Maple Ridge home from the Twenties. It appears in the book One Hundred More Historic Tulsa Homes, where John Brooks Walton calls the chapter How a Swimming Pool Designed a House. 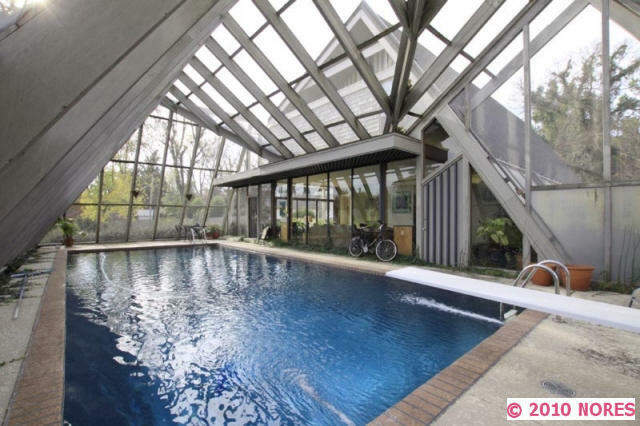 In 1957 the owners asked Robert Buchner to design a natatorium and integrate it into the east side of the house. A few months later fire partially destroyed the roof of the original house- so Buchner was called in again. The final result is a distinctive swimming pool with a house attached! For more details on the event, the organizers or who the heck Robert Buchner is visit Modern Tulsa. I love this house, I use to walk by it on my many walks around town. Just got word today that it's rubble.